Podcast pioneer and former MTV VJ Adam Curry shared this image of his podcasting setup on Flickr. 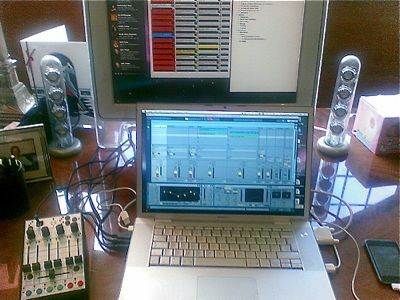 I spy what looks to be a Faderfox LC2, a Mac laptop running Ableton Live and a pair of Harmon Kardon Soundstick speakers. No sign of a mic. If you look in the upper left of that picture, it looks like there might be a boom mic stand connected to the desk. You can see the mic set-up on this picture from a different Flickr set. Is he using some sort of USB mic, then? I’m just wondering how he avoids an echo in that bigarsed room. He probably uses his mic very close to his mouth to minimize room sound. It can look obscene – but it works…. So THATS where he’s laying off all those employees from! Keen!